The original Sunnyboys line-up of Jeremy Oxley, Peter Oxley, Richard Burgman and Bil Bilson will make just their second-ever appearance in the southern surf-city playing a host of classics from their three stand-out albums Sunnyboys, Individuals and Get Some Fun. Local no-goodniks The Living Eyes join the party and will double the fun with their spirited take on sixties-garage and seventies-punk. Tickets are on-sale Friday 5th November. On April 22nd 2012, for the first time in 21 years, all four original members of Sydney band Sunnyboys, performed on-stage at Sydney’s Enmore Theatre. Appearing at the inaugural Dig It Up! Invitational the band played with the same intensity, verve and joy as they had all those years ago. It was emotional and inspired and there wasn’t a dry eye in the house. Fast forward to 2015 and the band have performed two sold-out tours of the country filling venues including the Sydney Opera House Concert Hall, Melbourne’s Forum Theatre (multiple times), Perth’s International Arts Festival; they have co-headlined the Meredith Music Festival and set a venue record previously held by Noiseworks at the Coolangatta Hotel. Now its Geelong’s turn to experience the magic. 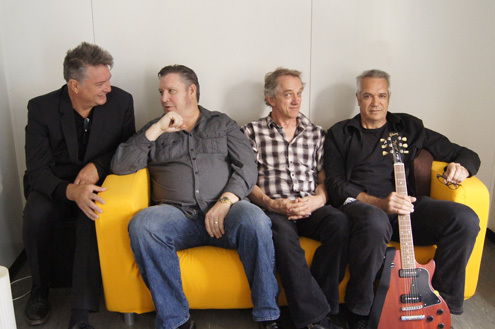 Don’t miss Sunnyboys, live in Geelong. Sunnyboys are also appearing at A Day On The Green this March with fellow indie-rock veterans Hoodoo Gurus, Violent Femmes, Died Pretty and Ratcat.